The alternative to the IELTS score is audio / video interviews taken by the Universities, or a proof of previous studies completed in English Language. 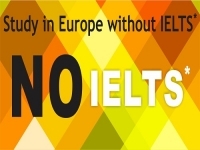 The land of food and fashion is another country to study in Europe if you are avoiding taking the IELTS test. Italy has a number of top ranked universities to boast of, and the bologna process, which is an attempt to have a uniformity in the European higher education, is name after the oldest operating university in the world. Some of the Universities in Italy, same as Germany, let you apply without IELTS scores if the previous education is in English language. Belgium: At Ghent Universities in Belgium, candidates are not required to provide their IELTS scores as an admission requirements, the only eligibility criteria for language they need to fulfil is to submit the proof that they have studies for a year at an English taught institution beforehand. Poland: At Jagiellonian University of Poland, which is one of the oldest universities in Europe, students can apply for a program if their medium of instruction in their latest educational program was English. Sweden: Universities in Sweden like Lund University and Uppsala Universities require IELTS scores as a course requirement, but there are some exemptions available if the students have completed the previous education in English language. It’s true that you can apply to good University in Europe without giving this entrance but you should have minimum good command on English. You should able to understand and speak English as intermediate user. If there is a course which is to be taught and assessed in English, a student is required to understand the language one way or the other. For that assessment, the Universities have audio and video interviews, previous studies in English and MOIs, and sometimes, the foundation courses for the non-native speakers to improve their language proficiency. Apart from these, there are number of short courses in Europe that have different language requirements. To get admission in such highly accredited University without giving IELTS hurry up & get yourself enrolled before the deadlines! Apply Now to study abroad and also get free counseling from experienced counselor.